Bed and Breakfast in Maidenhead.Maidenhead Berkshire is in England's 'Silicon Corridor' along the M4 motorway west of London.It is part of the Royal Borough of Windsor and Maidenhead. It grew in importance after the first road bridge was built there, spanning the Thames and on the thoroughfare between Bristol and London, now the M4.The next big change for Maidenhead came with the arrival of the Great Western Railway in 1838. Brunel spanned the Thames with the brick built railway bridge which still stands. The River Thames passses within a mile of Maidenhead town centre. Also see Maidenhead & Maidenhead attractions. If you are in the right town but cannot find the accommodation you want on this page, you might consider Maidenhead hotels or self catering accommodation in Maidenhead. A Swiss-run Guesthouse situated in a rural location surrounded by fields and wildlife yet only 1 Mile from Maidenhead train station and within easy reach of the M4 and M40. 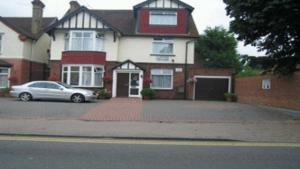 For B&B in other areas nearby see Bed and breakfast in Reading Bed and breakfast in High Wycombe.